he hotel was sited next door to the original East Collingwood Court House which gave the proprietor an obvious choice of name, and no doubt contributed to the custom. By the end of the century the court function had moved to the new Town Hall in Hoddle Street and the old court room was occupied by the Collingwood Working Men's Club, so the impending federation of states provided another choice of name. The hotel was closed by the Licenses Reduction Board in 1914, along with seven other hotels in the Barkly and Darling Wards. Most people walking past this building would assume the Victorian era pub was gone, because the frontage is composed of shops and office in a distinctive Moderne design (with later alterations). However a closer look reveals original chimneys and roof behind this facade, and peeking through the gate on the old carriageway on the west side gives the curious researcher gives a few more glimpses of the former hotel. 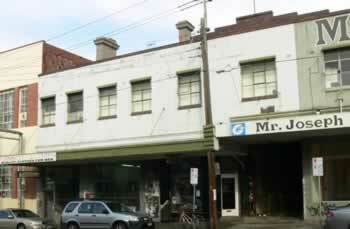 The building became part of a larger complex of neighbouring buildings housing Gregory Steel Products until the1960s.